More British passengers died on the Titanic because they queued politely for lifeboats, researchers believe. A behavioural economist says data suggests Britons in that era were more inclined to be "gentlemanly" while Americans were more "individualist". Women with children had a 70% better chance of survival than men in such an environment, he told the BBC. 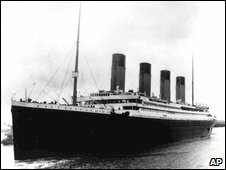 The Titanic sank during its maiden voyage in 1912 after hitting an iceberg, with the loss of 1,500 lives. David Savage, from Queensland University of Technology, studied the disaster to look at how people react in life and death situations. He said that in testimonies from inquiries in America and Britain just after the event, there were a lot of statements from women saying their husbands put them on lifeboats. They then "went to the back of the boat to have a cigar, to stand around and be chummy, while basically the boat went down". Mr Savage said: "There was one gentleman who was rather wealthy... who went back downstairs after he put his wife on the [life] boat... put on his tuxedo...went back upstairs and smoked... with the idea that if I am going die, I may as well die as a gentleman and well-dressed." The "unsinkable" ocean liner went down in freezing Atlantic waters during its voyage from Southampton to New York. As it sank, the captain, Edward John Smith, shouted: "Be British, boys, be British," according to witnesses. "The American culture was set up to be a more individualist culture and the British culture was more about the gentlemanly behaviour," Mr Savage says. "You've got to remember that this is the Edwardian period when to be a gentleman was the peak of society." Mr Savage also concludes that social norms such as "women and children first" were very strong in British culture and survived in such an environment.